Aurore was asking how I do my chalkboard and I realised that it was kinda difficult to explain and describe merely in words. Hence, a instructional pictorial for everyone today. 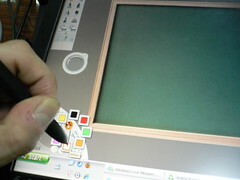 However, in this day and age, we hardly see graphics tablets unless you are in an industry heavy on computer graphics. 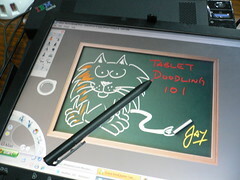 Next, you will need a software that allows you to use your tablet to doodle. 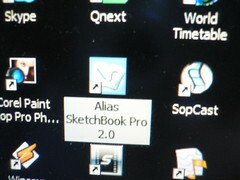 I don't recommend the mainstream Photoshop or Paintshop for this purpose.I use Alias SketchBook Pro 2.0 for it is more suited for doodling. One of the more important feature is its ability to detect pressure from the stylus onto the screen. When you press down harder, you get a thicker bolder stroke. A lightly slide of the stylus across the screen and you get a thinner fainter line. Once inside the software, open a graphic of a chalkboard or Post-It note or whatever you can find on the internet (or you can take a picture of a blank sheet of scrap paper and set it as your template). Pick a colour that you want. White is my default since it is a chalkboard. Thereafter, let your imagination take you the rest of the way. Add colour if you wish to make it livelier. 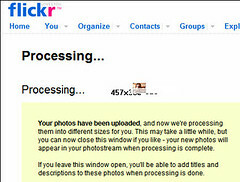 Next, upload to a photo host like Flickr or Photobucket and then link it back to your blog. 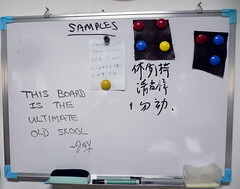 Alternatively, you can actually draw on a real board and then take it picture of it but that would be really old skool liao. Still, the options are limitless and you are free to choose whichever best suits you. 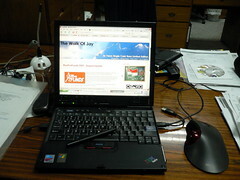 the pic of your laptop is so small.. cannot see.. and what mouse you using.. so big!! Gary: Thanks for spotting it. It was a typo in my html. Corrected already. That thing you see is not a mouse but a trackball. Different thing but same result. Trackball eliminates the risk of carpal tunnel syndrome. Click Here. Aurore: If it is not available at your local store, you can try shopping online like at Amazon.com Click Here. Barffie: Mai too liao!!! Draw something! !